Coming as a surprise to IndyCar racing observers, Justin Wilson left the #18 Dale Coyne Racing car for a second-car with the Dreyer & Reinbold team for 2010. 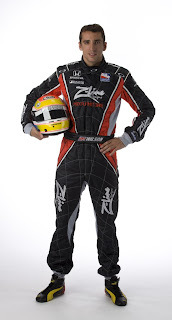 Set to drive the #22 car, Wilson will be joined by office furniture company Z-Line Design which sponsored the British driver through the 2009 schedule. With fellow Brit Mike Conway remaining in the Dreyer & Reinbold Racing organization after his 2009 rookie campaign, team co-owner Dennis Reinhold expressed optimism about the team's 2010 efforts. "We're excited to have Justin and Mike join us, Mike back for his second year, and obviously Justin has been in the league with a high degree of success for a long time." Reinhold said also adding that a third team could be brought to life with the right funding and driver. Dreyer & Reinbold Racing has been in the IndyCar Series ( through earlier years known as the Indy Racing League) since 1999 and has sported driving talents such as Robbie Buhl, Sarah Fisher, and Al Unser Jr. The race team also played a part in Ryan Briscoe's career before he joined Penske Racing IndyCar operation in 2008. In a teleconference, Wilson shared his thoughts on leaving his 2009 team. "It was a pretty tough call to leave Dale and move on with my career. That's not an easy decision. I just got to thank Dale and Gail (Coyne) for everything they've done. It was a great year. I have really fond memories." With the departure of Justin Wilson and Z-Line Designs, Dale Coyne Racing is still in prime position for the 2010 IZOD IndyCar Series season. In early January, Dale Coyne Racing announced securing sponsorship from the Boy Scouts of America for 2010 for what was believed to have been a second car for the team. Graham Rahal, who has been teetering on resigning with Newman/Haas/Lanigan or entertaining other interested teams, is Dale Coyne's personal pick to fill his team's vacancy for a driver. With the 2010 IZOD IndyCar series set to start on March 14th in Sao Paulo, Brazil, this late season game of musical chairs is occurring against a rapidly approaching green flag.